Welcome back to Kind of Curious! I hate to say, but it’s been almost a year since I last posted. So I have quite a backlog of curious things to write about. A great place to begin describing the wonderful things we saw in Italy is Santa Croce Basilica in Florence. There seems to be a church on every street corner in Italy (sometimes 3 or 4 on a corner), each with priceless art or religious relics of the kind that in the US can only be found in museums. 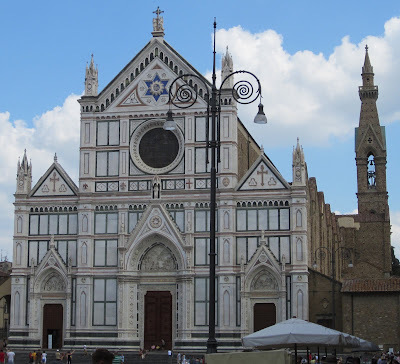 What is unique about Santa Croce is that it has become a monument to the famous sons and daughters of Italy. Because of this, it is sometimes called the “Pantheon of Italian Glories” (“pantheon” being Greek for “temple of the gods”). That’s sort of a sacrilegious nickname for a church, but not the only inconsistent thing going on here as you will see. A church has been at this site since 1210. 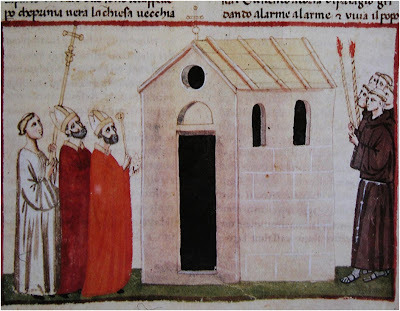 The caption for the above drawing on Santa Croce’s website begins “around 1252 it was felt necessary to construct a church that was larger…”. I would have to agree with that. The priests look a little worried about where the congregation is going to sit. The present church began construction in 1294 and was mostly completed by 1442. We get excited in the US when we see something from the 1700’s! The marble façade that gives the church the look it has today was not completed until 1863. Who in the US would embark on a construction project that would take over 500 years to complete? 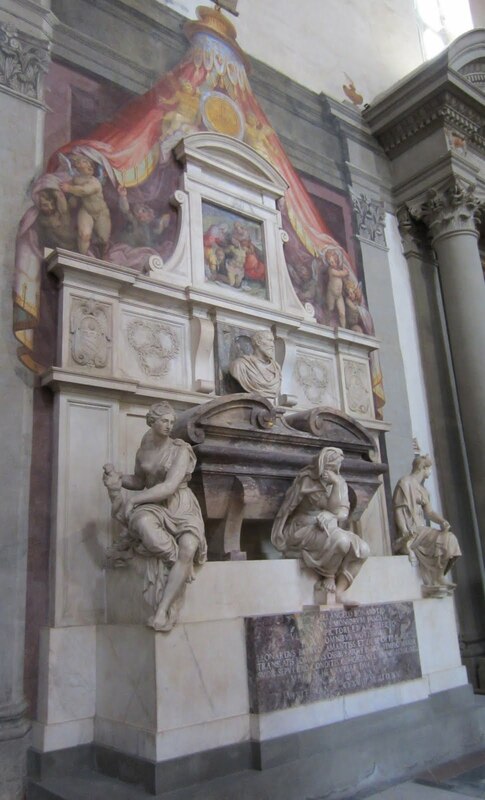 Santa Croce’s journey to become the “Pantheon of Italian Glories” began in 1570, when they decided to build a tomb for Renaissance artist Michelangelo, who lived much of his life in Florence. 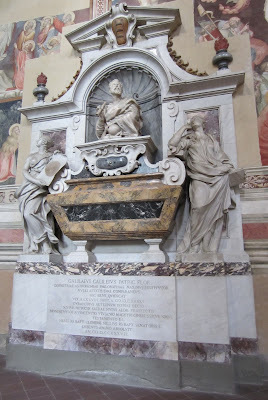 Since that time they have added many more tombs of the rich and famous, including that of the “father of modern science” Galileo, which was completed in 1737. 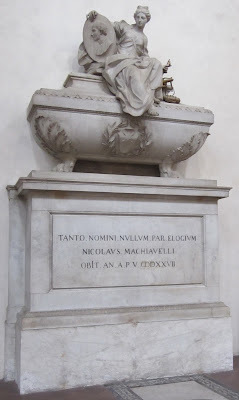 Renaissance author Machiavelli is also buried here. 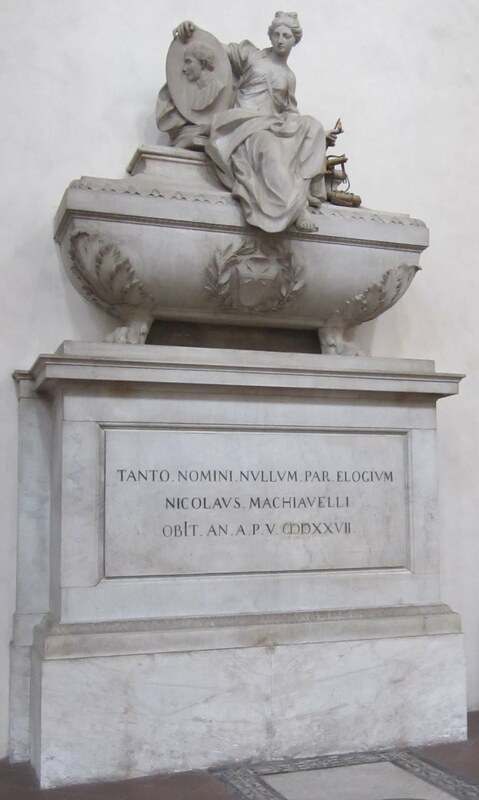 If you deceive and manipulate others for your personal gain you are “Machiavellian”, like the advice given to the title character in Machiavelli’s book The Prince. Galileo’s tomb is shown at the beginning of this post. It is ironic that Galileo is buried here, considering his rocky relationship with the Catholic church. Galileo was placed under house arrest by the Inquisition in 1633 for his support of Copernicus’ heretical observation that the earth revolved around the sun (rather than the earth being the center of the universe as described in the bible). Galileo died in 1642. The church allowed some of Galileo’s works to be reprinted in 1718, which would explain why a monument in his honor would be allowed in Santa Croce in 1737. But his book that was at the center of this controversy, Dialogue Concerning the Two Chief World Systems, was not allowed to be reprinted in its uncensored version until 1835. And it wasn’t until 1992 that Pope John Paul II finally admitted that the church had made a mistake in condemning Galileo! Incidentally, Machiavelli’s book The Prince was also banned by the Catholic church. But this was not until after his death, and he was not accused of heresy. Although his Machiavellian ideas do not seem Christ-like, the book was actually banned because French leaders who were following its advice were being accused of corruption. Here is the exterior of the church. Note that the marble is only on the front. There was no word as to whether they are planning on finishing the sides and back with marble as well. Give them time, it’s only been 700 years. And note the blue Star of David just below the peak of the top roof. The architect for the façade was Jewish, and in an inspiring act of interfaith cooperation was allowed to include the Star of David. He is even buried on the church grounds. I need to get myself back to Florence! I believe I was 5 when my family went? Obviously don't remember anything of the trip (which included Pisa and Rome) and the only time I've been back to the boot was a brief visit to Genoa for work... My parents went back to Florence 2 years ago and went on and on and on about how lovely it was. I look forward to reading more from your trip! And hoping to contrast your observations with mine if you land in a city I've visited. Thanks Cris! It's nice to be back writing again. "Galileo was placed under house arrest by the Inquisition in 1633 for his support of Copernicus’ heretical observation that the earth revolved around the sun (rather than the earth being the center of the universe as described in the bible)." Nowhere does it say this in the Bible. Hermes can be described as potentially referred to type residential home not to mention label which may be appreciated from a lot of women across the globe. Typically the label omega replica sale seems to have developed a large number of specific creations when considering wholesale handbags, year after year; but, a particular pouch of which keeps especially widely known up to the point big day will be Hermes Kelly pouch that had been given the name when the actress Grace Kelly. Typically the delightful actress Grace Kelly even materialized hublot replica sale to always be typically the Romantic from Monaco, not to mention at their gestation subsequent to their holy matrimony, this lady isn't especially more comfortable explaining their immense stomach area in the multimedia. By means of who, on her people cartier replica sale shows, this lady was basically seen to always be hidden their gestation with the help of their Hermes pouch. When ever lots of people obtained are familiar with this unique bit hidden knowledge, illustrations or photos of this actress hidden their gestation with the help of their handbag are get spread around across the globe. Typically the pouch therefore had become which means widely known that going barefoot started to chanel replica turn out to be termed typically the "Kelly Bag". Director eyes narrowed air jordan 4 uk on the cheap says. cheap quickly said the director, really, I mean really, nike air jordan 4 retro sale nike air jordan 4 retro sale I did not know him ah. cheap nike air jordan 4 shoes Really. cheap, you do not lie, oh, thirteen Street thing you can not deceive nike air jordan 4 retro sale me. nike air jordan 4 retro sale I really do not know him. من ناحية أخرى ، قد تدخل النمل الأبيض الجوفية ، التي مستعمراتها تحت الأرض ، منزلك من خلال أسسها. لأن هذه النمل الأبيض العلف للغذاء ، فإنها قد تتعثر على مصدر جديد للأغذية الغنية - منزلك. عادة ما تقوم النمل الأبيض الجوفي ببناء أنفاق طينية فوق جدران الأساس للوصول إلى الأجزاء الخشبية من الهيكل. النمل الأبيض تحت سطح الأرض مسؤول عن 95٪ من أضرار النمل الأبيض في الولايات المتحدة.